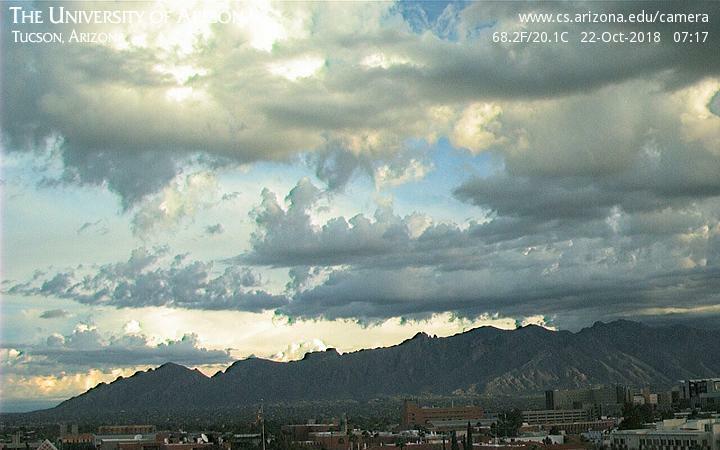 Overcast high clouds this morning here in Tucson. 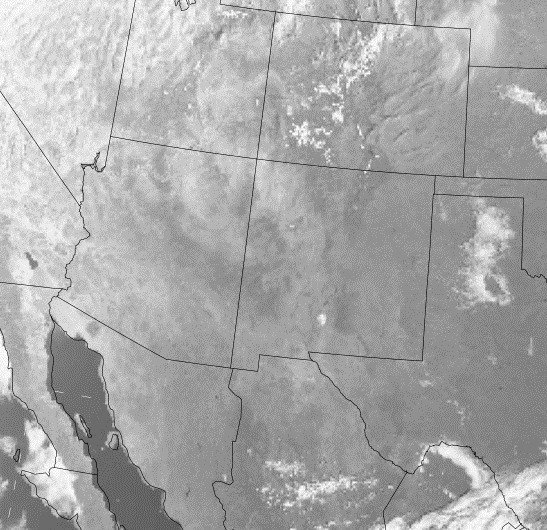 The 1430 UTC IR image below shows that clouds are coming from low latitudes, but with back edge more or less north-to-south across Arizona. A sharpening 500 mb short wave will be crossing Arizona tonight and tomorrow. The WRF forecasts keep precipitation across northeastern third of state, while gradually clearing away the clouds this afternoon, allowing some gusty winds to setup over our area. 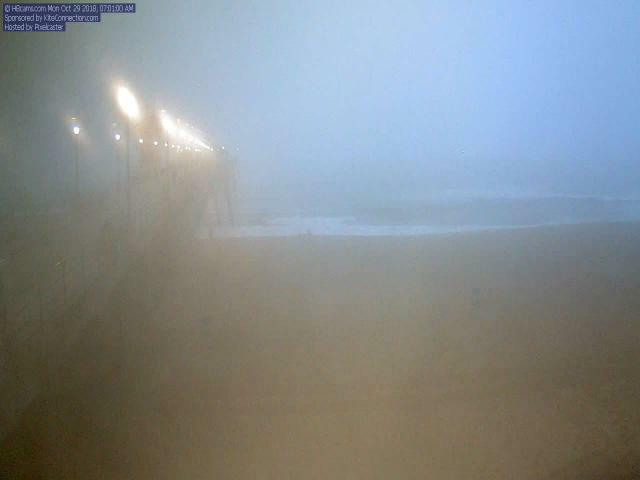 Two images here from Jack Hales webcam wall. 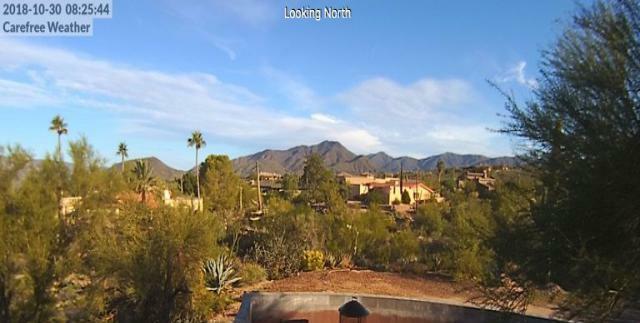 Carefree, Arizona, north of Phoenix is definitely not dreary this morning - above. 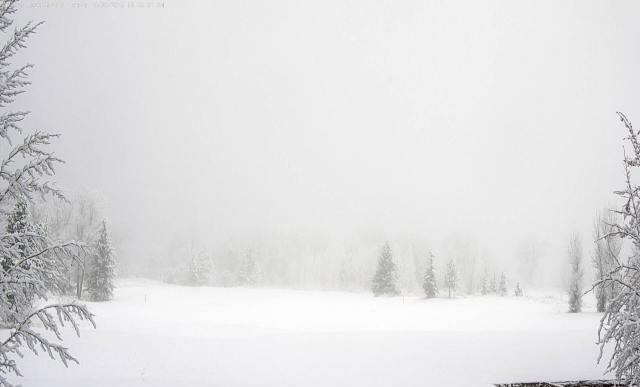 In contrast, no tee times at the Jackson, Wyoming, golf course today - below. 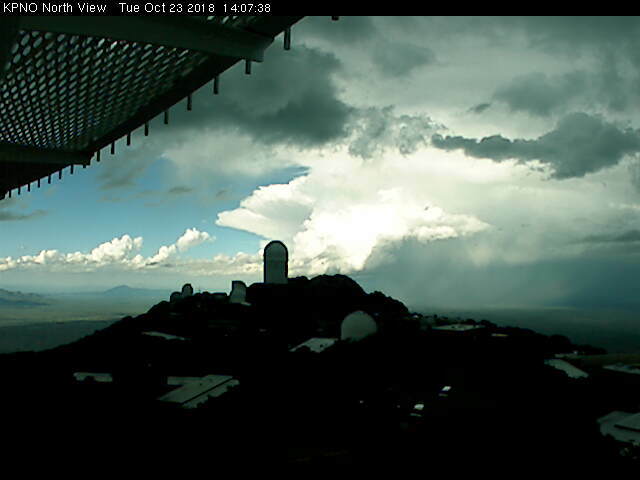 Nice view of storms and anvils north of Kitt Peak a bit after 2:00 pm MST yesterday afternoon. 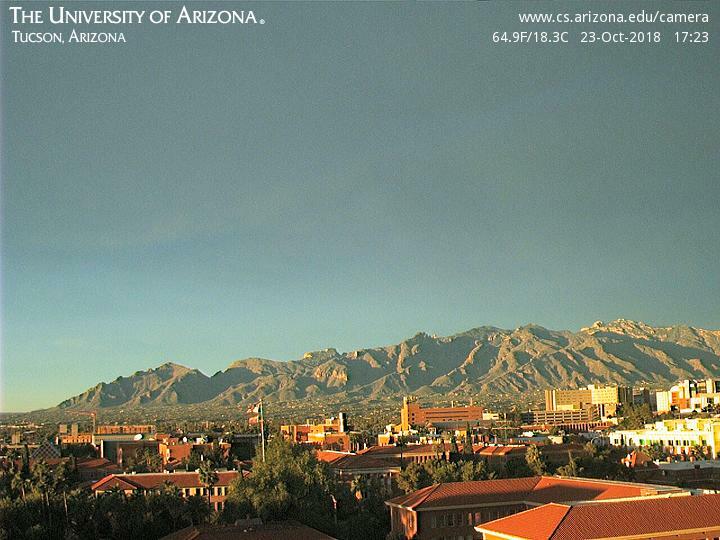 Here in Tucson, the sun was shining on the Catalinas at 5:23 pm - bottom. Flash density for CGs above for 24-hours ending at 6:30 am this morning (from weather.graphics and Vaisala). 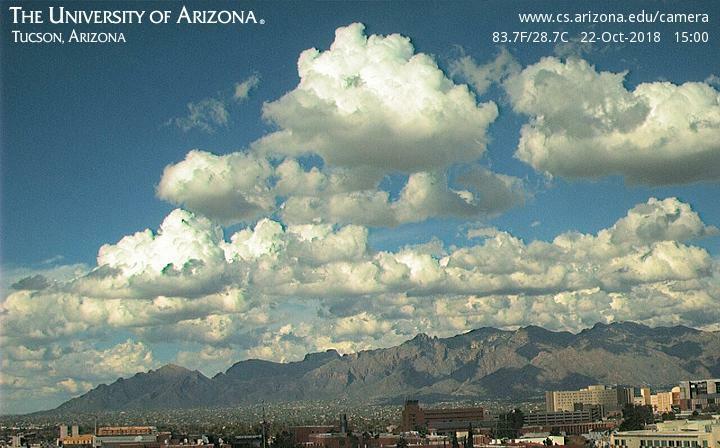 Most thunderstorm activity was in southeast and also central Arizona yesterday. There were 8 reports of storms producing severe hail (>1 inch diameter) yesterday and all were in Tucson or Phoenix areas. The rainfall observations across the Pima County ALERT network are shown below for north portion (24-hours ending at 6:00 am this morning). Only one station near downtown did not measure at least 0.04". In the south portion of network Arivaca had 1.42", and the only other report of more than inch I found in quick scan of observations this morning was 1.16" at Douglas. There were 23 ALERT sites with half an inch or more. Here at house we ended up with 0.63". Most of that (0.53") fell in about 15 minutes with the mid-morning, intense thunderstorm, rest was with light showers from thick anvils through mid-afternoon. Here at house we now have 3.25" for October, which is second wettest in past 20 years (but much less than the 5.06 of October 2000). This month is also much wetter than any other of 2018. What are chances of a bit more before November? - long-range model forecasts indicate that the last day or so have at least slight possibilities. The GEFS 500 mb spaghetti plot above shows much variance among the various members over the Southwest. While the same deterministic forecast from the ECMWF below, indicates a closed low over Arizona. Both of these long-range forecasts are valid at 5:00 pm on Halloween. 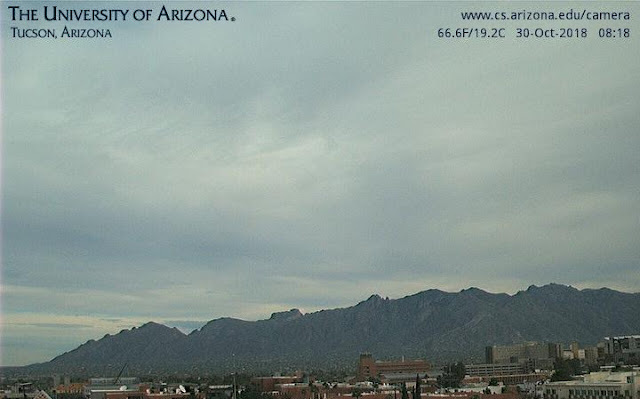 View from campus at 10:00 am MST shows spot of sunshine, and darkening to left as thunderstorm approaches north part of metro after developing over the Tucson Mountains. The CG flashes below in pink and white show the thunderstorm progressing across north part of Tucson. The detected flashes also show that storms to southeast did not develop northwestward, but rather that a new line developed at mid-morning. Today is one where forecast signals are mixed - but at this early hour towers are already bubbling up here and there. 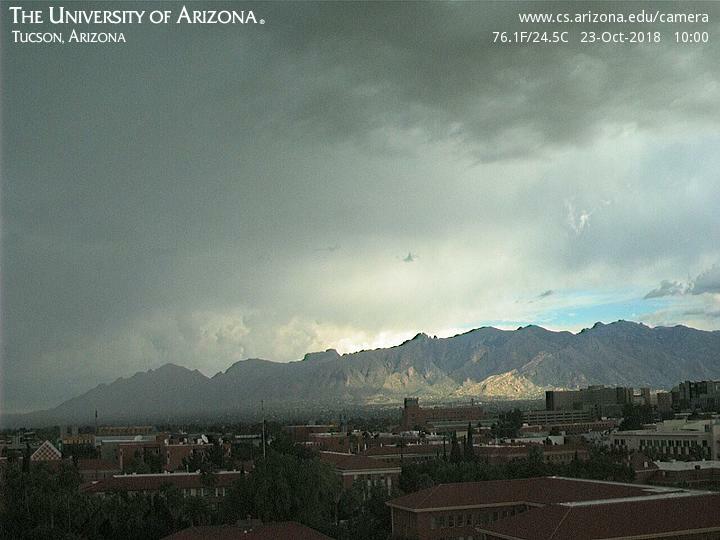 North view from campus captures bit of this and also shows thunderstorms to the distance north. Before sunrise I could see flashes to distant north from these storms. 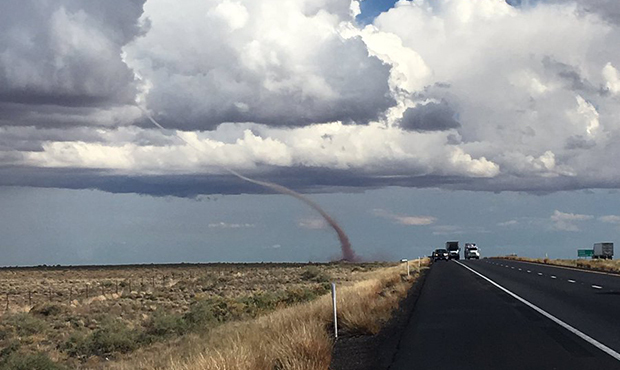 All of the severe thunderstorm reports in the U.S. yesterday were from Arizona (above), including a landspout-type tornado along I-40 in northern Arizona (photo of this event below). Second below shows detected CG flashes (from Vaisala and Atmo) for 24-hours ending at 6:25 am MST this morning. A very active storm day for many parts of state - especially for October. The early morning storms to our north were mostly in Pinal County. The ALERT rainfall data for 24-hours ending at 6:00 am this morning are shown above and below. Amounts were all over the place, ranging from nothing measured to almost an inch. Here at the house we were mostly under anvils from the southwest. There was thunder and a few sprinkle showers that left behind 0.04". Today is one with mixed signals, as I mentioned above. First, the 06 UTC WRF runs, plus this morning's WRF-RR forecast only limited activity over eastern Pima County today - this appears to be due to drying during the afternoon. However, the 12 UTC skew-T plot for TWC (above from SPC) appears very favorable for strong storms, and has a better BL structure than did yesterday's. The wind profile seems even more favorable for severe thunderstorms. The model forecasted soundings look good too - so apparently the shear and dry air from 700 to 400 mb prevent storms from developing in the model forecasts - we will just have to watch what transpires. Finally, Hurricane Willa (IR image below from 13 UTC this morning) is moving northward and is very intense - just below Category 5 strength. 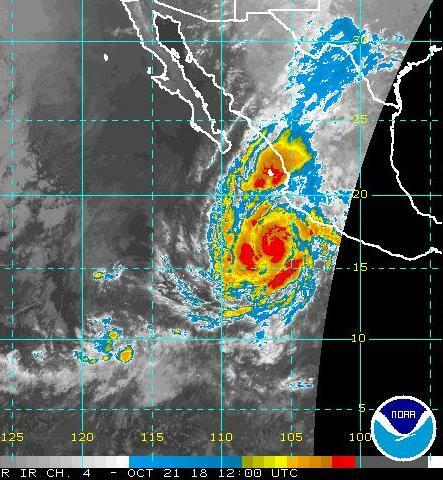 The storm is forecast to turn northeastward and strike the west-central coast of Mexico, as a very dangerous storm. Santa Ritas at sunrise yesterday were shrouded by a large cap cloud. No storms in southeast Arizona yesterday afternoon, but strong east winds of 30 to 40 mph were bringing in low-levl moisture from New Mexico. The Mt. Hopkins RAWS gusted to 45 mph , while the airport here hit 41 mph. The plot of detected CG flashes (below from Atmo and Vaisala for 12-hours ending 6:45 am MST this morning) indicates morning storms northwest of Phoenix. 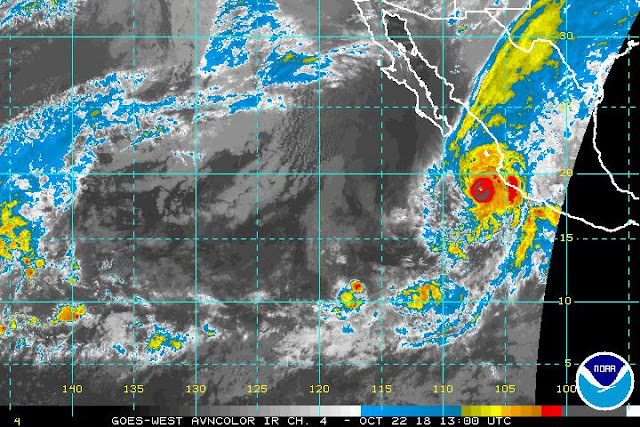 More widespread thunderstorm activity was associated with Hurricane Willa off coast of Mexico. 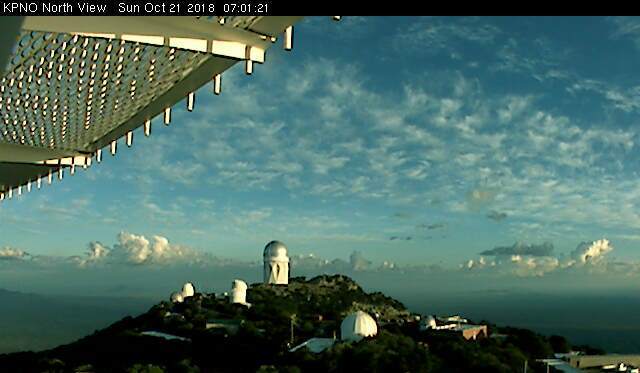 There are towering Cu here and there this morning, as per view to north from Kitt Peak. Closed low portion of West Coast Rex block (500 mb analysis above for 12 UTC this morning from SPC, as is skew-T analysis below) will slowly progress eastward across the Southwest next several days, bringing chances for more rains and storms here. The morning sounding shows several interesting structures. East winds have increased low-level moisture below 800 mb, but this layer is rather stable. However, southerly winds above have brought in middle-level moisture and CAPE that is impressive. The strongly veering, Plains-type, wind profile favors strong to severe thunderstorms, with 30 to 40 mph steering winds from the southwest. Second below is current 12 UTC WRF-RR forecast of composite radar echoes valid at 4:00 pm this afternoon - if forecast models are accurate both this afternoon and tomorrow will be very active with strong to severe thunderstorms and possible hail. 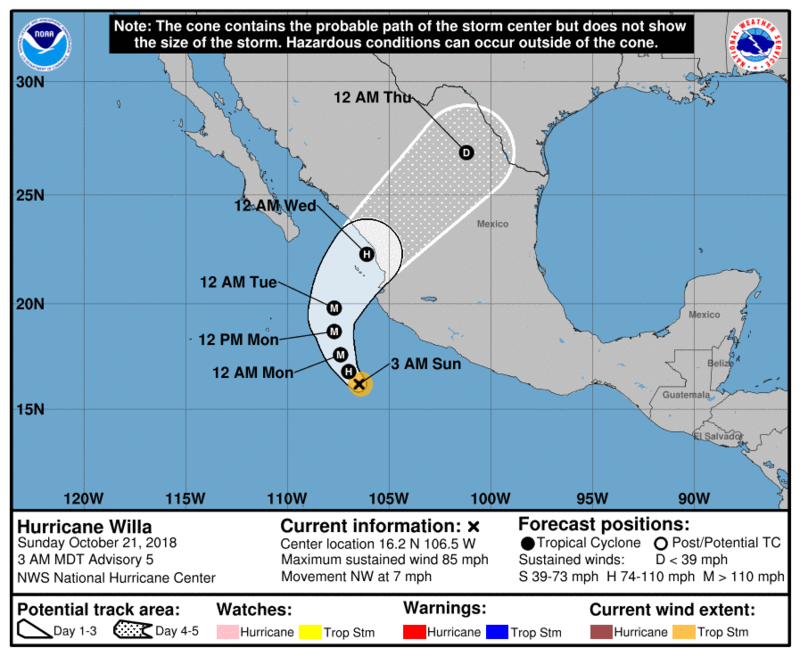 Meanwhile to south, Hurricane Willa is strengthening south of Cabo Corrientes. The morning forecast from NHC indicates a landfall by midweek near Mazatlan. There is little change in the model forecasts this morning wrt to yesterday's post. Low-level moisture is increasing from the east and then will be joined by higher PW from the south later this weekend. The plumes for QPF at TUS (above from 06 UTC forecast runs this morning) all indicate measurable rainfall at the airport by early Monday. The 06 UTC forecast from the WRF-GFS (below, valid through 5:00 am MST on Monday morning) actually forecasts amounts at the airport (0.4") greater than any of the ensemble members - this is due to model forecasting that airport will get a direct hit by a thunderstorm. All of the higher amounts in WRF forecast are due to thunderstorms the model develops, and we know that where and when forecasts of such isolated events are usually not very accurate. But the increased moisture and trough to west continue to indicate that we'll see showers and storms here and there over weekend. Yesterday was an interesting situation wrt the strong easterly winds. 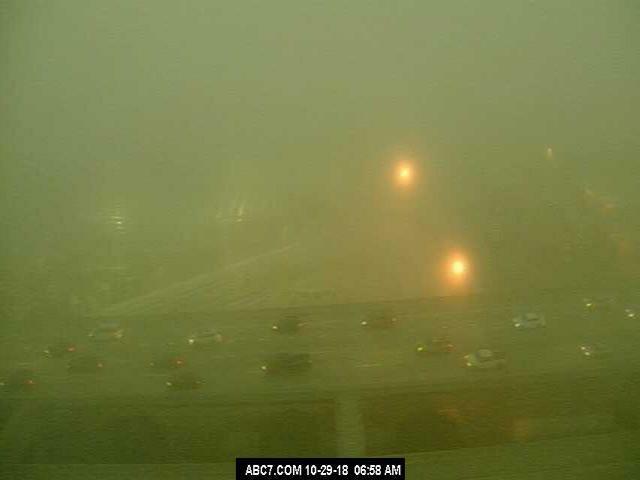 The airport recorded gusts as high as 38 mph during the day. However, over around the Santa Ritas and Mt. Hopkins, the easterly winds reached only to about half the mountain heights, and were not deep enough to trigger the very strong gap winds that are often measured at the Hopkins RAWS site. The WRF forecasts captured the wind structure quite well, indicating east winds veering to southerly by mountain top levels. Result was maximum gusts of 36 MPH at the RAWS site - less than those down at TUS. 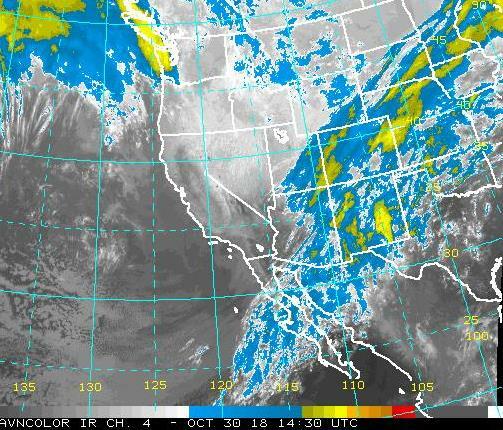 Total PW (above is MIMIC PW analysis for 5:00 am MST this morning) is low across most of Arizona; however, more moist air is has inched northward along the east coast of the GoC. There is also higher moisture to our east over southern New Mexico and southwest Texas, where rainfall is fairly widespread. The 06 UTC WRF forecasts indicate moisture initially increasing here from the east, and then later from up the GoC. Forecast below is of PW from the GFS version on the 5.4 km grid - it is valid at 5:00 am on Sunday the 21st. Forecast plumes from the GEFS indicate a rapid increase of PW through Friday at TUS (above). The moisture increase results in a chance for light showers over the weekend - below. The increased moisture is forecast to interact with another weak wave approaching from our west - at least something to watch as weekend approaches. 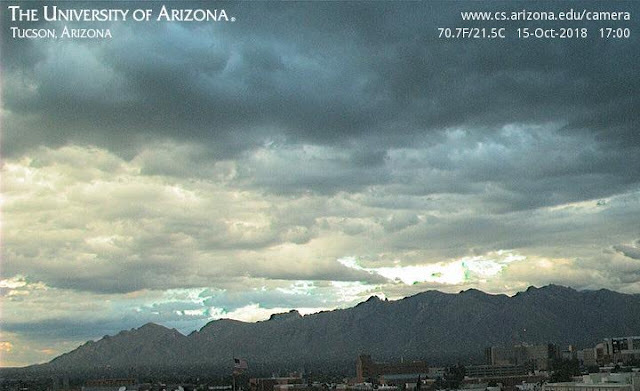 View from campus of heavy clouds rolling in at 5:00 pm MST yesterday afternoon. Once again 100% rainfall coverage across the ALERT network (except Tubac which had less than 0.04"), with heaviest amounts along west side of Catalinas. The Rillito was flowing this morning following the nighttime rains. Here at the house there was a bit of rain before midnight, but most of the 0.43" in the gauge this morning fell during a brief, heavy thunderstorm around 2:00 am. Atmo also measured 0.43" and TUS had 0.41", but DM reports only 0.16". Here at house the 2.57" of rain so far this month makes it already the second wettest October in my 20 years of records. The morning 500 mb analysis (below, from SPC) shows the center of the closed low out near Quartzsite in western Arizona. However, a short wave swinging around southeast side of the low is shifting moisture and precipitation eastward. Bottom two graphics are morning skew-T plots for TWC and Yuma at bottom (also from SPC), While TWC was very moist at sounding time, the short wave has taken the showers on to the east. There is very dry air aloft coming around the west side of the cyclone, as per the Yuma sounding. The 12 UTC WRF-RR this morning forecasts a few light showers around eastern Pima County this afternoon - followed by dry conditions that will likely continue until the weekend.